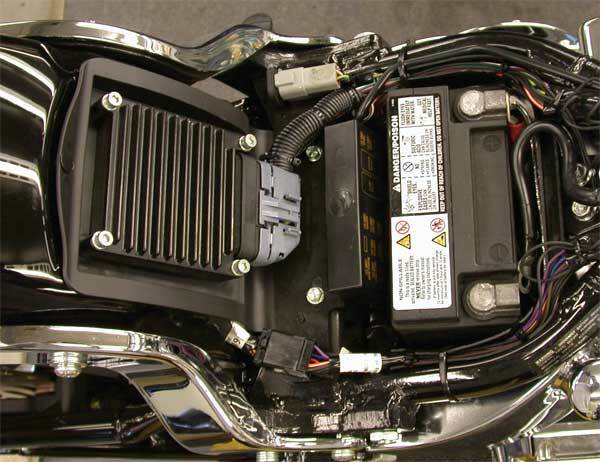 An H-D’s electronic control unit (ECU) has look-up tables, also called fuel maps, that are a set of memorized fuel settings for different rpm, throttle position, load, and other conditions. This system works well until the memorized fuel settings don’t match the engine’s new requirements, due to cam, exhaust, displacement, and other changes. Last month, we covered potentiometer-style add-on tuning devices. One that wasn’t mentioned, but probably should have been, is the Cobra FI2000. It is similar to the four-pot TFI, DFO, and Wild Things FI controller, but it only has three pots because the rpm transition is fixed. By the time this article hits the newsstands, the third generation of the TFI, DFO, and Wild Things FI devices will be on the market. On the new units, the four pots are replaced by three buttons, a mode select, and plus and minus functions, so they really are digital. According to Lloyd Greer of Lloydz.com, who is developing a tuning device for the Polaris Victory, this upgrade allows more flexibility in implementation, but most companies will probably market them for Harleys as two-band fuel enricheners. In the last article, I gave you a couple of sample air/fuel curves and hinted that, once you lose the stock cams for higher performance ones, none of these units, or even the Screamin’ Eagle Race Fueler, will be able to divide the rpm band into small enough ranges to handle the new air/fuel curves. Maybe it’ll take a map-style device, such as a Power Commander add-on, Screamin’ Eagle Race Tuner, or Direct Link programmer. And how about those systems that “tune themselves while you ride”? That’d be nice, wouldn’t it? We’ll get into all of them in a minute, but first we need to look a little deeper into how fuel injection works. So many guys say they understand carburetors, but fuel injection is still a mystery, so this one’s for them! Let’s face it: fuel infection, as some dyed-in-the-wool carb guys refer to it, is here to stay. Many people think that achieving the stoichiometric 14.7:1 ratio was the force that drove the changeover to fuel injection in cars in the late 1980s. That’s not entirely true. When 14.7:1 was mandated in the early 1980s, most cars with carburetors achieved it with slightly rich jetting and an air bypass valve in the intake manifold. A computer controlled by an oxygen sensor in the exhaust then leaned the mixture to 14.7:1, using a feedback or closed-loop system. However, making a carburetor-based system track varying altitudes and temperatures, especially under stricter open-loop (richer that 14.7) conditions, required more and more small vacuum sensors, valves, and hoses every model year. When it got to the point that you couldn’t find the engine for all the hoses crawling all over it, the engineers gave up and went to electronic fuel injection. Hey, maybe it didn’t happen quite that way, but as tighter motorcycle emissions phase in, you sure don’t want little hoses all over your bike, do you? Remember, what the engine needs to cruise nicely is an air/fuel ratio in the 14.5 15:1 range, with 14.7:1 being the most environmentally friendly ratio, and near 13:1 being the ideal mix when you call for maximum ponies with your right hand. Overshooting on the richer side just wastes fuel. Too lean can both waste fuel and do engine damage from too much heat buildup. Let’s take a look at how a carburetor does the job. As air flows through a venturi, it picks up fuel from the top end of an emulsion tube. The main jet, located in the bottom end of the tube, controls fuel flow. At full throttle, this basic design maintains a nearly constant air/fuel mixture ratio over quite a wide range of airflow rates. Either a tapered slide needle or an intermediate jet controls the mixture at partial throttle. So, on a carbureted Harley, we only need to select the proper jet sizes and/or needle heights to tune for the desired air/fuel ratios. Poor exhaust scavenging can mess up the mixture, but once we get the backpressure right, the rest is pretty straightforward. If a fuel injection system is to copy the action of a carburetor, all we ask of it is to measure the air flowing into the engine and then inject the proper volume of fuel. Sounds pretty simple, doesn’t it? An airflow meter sends a signal to a computer that opens fuel injectors for the appropriate pulse width to produce the desired air/fuel ratio. Add on a few sensors to monitor ambient conditions and engine temperatures and it works better than a carburetor ever could. Done deal, right? But neither the Magneti-Marelli (found on EFIequipped Touring models until 2001) nor the Delphi (2002-later Touring models, and all other 2001-later EFI bikes) system actually works that way. Flow meters fit well under the hood of a car, but there simply isn’t room for one on the intake of a Harley. You could probably have fit a meter in the lunchbox air cleaner that Buells had for a few years, but you know how long those boxes stayed on the bikes. So, without room for a flow meter, what do we do? We can run the engine on a dyno in the lab, hook up one of those big flow meters, and then measure and record the actual airflow at various engine speeds, throttle positions, and loads. From that data, we could make a look-up table that the bike’s electronic control unit (ECU or ECM, as H-D calls it) could use to match fuel delivery to our actual throttle opening and rpm as we ride down the road. Well, other than the tables being called fuel “maps,” that’s exactly how it’s done. Essentially, fuel delivery is determined from what I call a set of memorized answers. Reminds me of the courses in school I got through by memorizing the answers to the questions most likely to be on the tests. Worked well until the test questions didn’t match my answers! On the bike, we “change the questions” when we change the cams, exhaust, displacement, etc. When the old memorized answers in the ECU no longer match the new airflow, we end up with a poorly performing machine. What we need to restore proper fuel delivery — to retune the bike — after we make component changes is some way to either change the ECU’s memory or modify its output. But what about ignition timing? Don’t we need to change that, too? On Evos, the answer is yes, since a few degrees can make a 5-hp difference. But Twin Cams have Harley’s very effective anti-knock ignition system. This system is so effective that it makes trying to tune the ignition a waste of time. I almost never even look at the timing maps on a Power Commander or a Race Tuner, but for this article, I tried putting in 0, 4, and 7 degrees of advance with a Power Commander on a Twin Cam that I was tuning the other day. The difference in the horsepower and torque curves was barely noticeable. The Twin Cam ignition system just takes out any extra advance you try to put in and does it instantaneously so that you rarely hear pinging. By the way, did you ever think about what we mean by the word “tuning” or “tuned”? To a Harley owner, it likely means “runs perfect under all conditions,” whereas to a dealer or some dyno tuners, it may mean “runs good enough to collect the money and not have you come back.” Both are quite subjective definitions. The objective measure of state of tune is the air/fuel ratios we mentioned above, and performing an air/fuel test on a dyno is the only way to get that information. Throw in the maybe 10 percent bike-to-bike variation due to cam timing, compression, etc., and you can begin to understand that what works perfectly (such as Harley’s download calibrations) on one bike may give entirely different results on another bike, even though they have the same components. It’s the old “your results may vary” disclaimer. Now that we have some basics under our belts, let’s go over three of the map-style tuners that can be used to compensate for virtually any combination of performance parts. Dynojet’s Power Commander is a mapbased device that’s essentially an add-on computer that connects in series at the bike’s stock ECU. You can program the PC with another computer to adjust the mixture at various engine speeds and throttle positions. 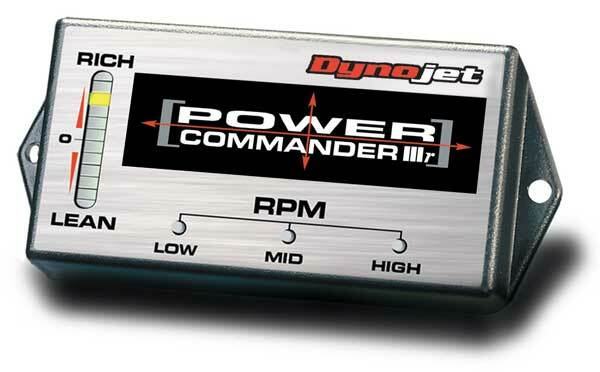 Dynojet’s Power Commander, a mapbased device, is essentially an add-on computer that connects in series at the ECU. We program the PC with another computer, or even a palm pilot, to adjust the mixture at various engine speeds and throttle positions, as shown on the Sample Power Commander Fuel Table. The numbers in each cell represent the percentage of change in fuel delivery that we are making, positive numbers indicating richer and negative numbers indicating leaner changes. (The three buttons on the front panel allow manual step adjustments, richer or leaner, in 2000-rpm wide fixed bands.) While tuning on the dyno, live throttle position and rpm data are displayed on the screen to the right of the selected table. The table shown is from the current USB model with the resolution maximized, which allows tuning every 250 rpm. Separate tuning tables for the front and rear cylinders are available. Although seldom used, ignition timing tables are available for each cylinder. Current models allow the rev limiter to be raised to 6200 rpm and start-up fuel to be adjusted. Popping during deceleration is about a 10-second fix with a Power Commander in all but the most stubborn cases. Another big plus (especially for a customer paying for dyno time) is the PC’s download speed. The whole map (two fuel and two ignition tables) takes less than five seconds to download from the tuning computer into the Power Commander. An additional, and very important, feature is that this is done live with the bike running — even at speed — on the dyno. Downloading an individual table, which is usually what the tuner is working with on a dyno, is nearly instantaneous. Considering the fact that there could be 20-30 or so downloads per tune, as we’ll soon see, the download speed, and more importantly, the device’s live-load ability, are major advantages. Each Power Commander comes with a CD with the latest maps for many component combinations, and new maps are provided free on the web site as they are developed. A great feature that is often overlooked is the option to start where the last guy left off by reading the current map stored in the Power Commander. Sometimes just a little tweaking is needed, so why start over? 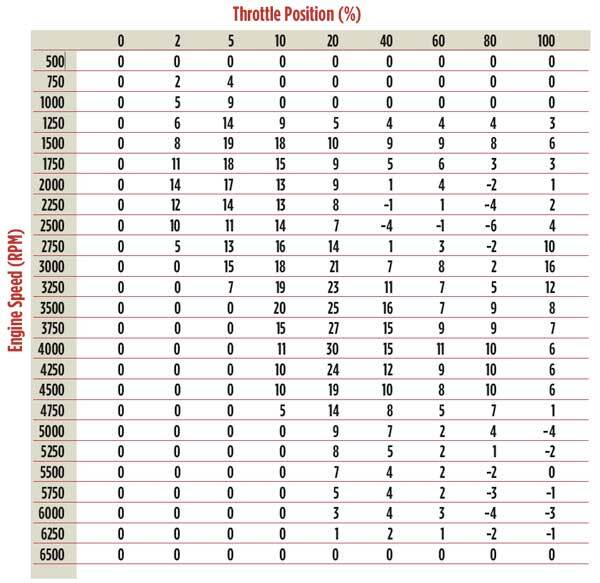 The numbers in each cell of this table represent the percentage of change we are making in the amount of fuel delivered at each of these specific engine rpm and throttle positions. A positive number indicates a richer mixture and a negative number indicates a leaner one, while a zero means no change has been made. A programmer is a device that allows you to go into and change some of the software in the bike’s stock ECU. Although a hardware “key” is necessary to unlock the ECU so that it will accept changes from an external computer, no parts are left attached to the bike after the software data transfer, or download, is done. We’ll discuss two of these devices here: Harley’s Screamin’ Eagle Race Tuner (SERT) and TechnoResearch’s Direct Link. Similar to the Power Commander, these programmers are map-based. In addition to fuel and ignition tables, they allow access to starting and warm-up fuel and rpm functions. A useful feature is the ability to set the injector size that the ECU thinks it is working with, which provides an easy way to enrich or lean all fuel maps at once. The rev limiter can be set from well below stock to speeds your engine will only see once. In Basic Mode, changing air/fuel ratios is very similar to the Power Commander because they also use a zero-based map. If you’ve worked with Power Commanders at all, an annoying quandary with the SERT presents itself immediately. The tuning maps and data monitoring modes are separate programs that can’t share the interface to the bike. You have to alternately stop and restart each to use the other. While Direct Link has a similar limitation, navigating its menus and functions is much less cumbersome. As an example, with the SERT, the air/fuel adjustment range in Basic Mode is very limited — about 20 percent total, or just over one point of deviation. Direct Link doesn’t impose such seemingly arbitrary limits. Since few bikes ever run badly enough to come to a dyno less than maybe 1.5 points off, Advanced Mode tuning is almost always needed. This mode brings up an air/fuel ratio table that is at best wishful thinking and at worst a marketing gimmick. And don’t get me started with where you have to go when you run out of adjustment on the air/fuel tables — the dreaded volumetric efficiency (VE) tables. More fun! The numbers range from the 60s to over 110, and when you change them, the air/fuel ratio changes, so you tune that way. However, since you lose the option to tune both cylinders at once with the VE tables, you get to do it all over again with the other cylinder. Direct Link allows zero-based tables and two-cylinder tuning. With either programmer, download time is 30 seconds with the ignition switch on and engine not running, followed by 10 seconds with the ignition turned off. That doesn’t sound like much, but what it forces you to do is shift down to neutral, shut the bike off, restart it, and shift up every time you make an adjustment. Tuning a bike properly can take hours. It may take less time if you can start where the previous download left off. To do that, you need a copy of the last file that was loaded into the ECU, because since the ECU is writeonly, it won’t let you read the maps out of it like a Power Commander will. When it first went on the dyno, Dave’s 2003 Ultra Classic had a lean “mountain” right in the middle of the riding range: a 15:1 air/fuel ratio at full throttle at 72.6 mph. Now for the two examples we introduced last month, starting with Dave’s 2003 Ultra Classic. Dave brought his bike to my dyno because he thought it had a problem. Although it had a by-the-book 95" Stage II racing kit with all Screamin’ Eagle parts installed to match the download, something didn’t seem quite right. The baseline test (fourth run, blue lines) immediately highlighted the problem — a lean “mountain” right in the middle of the riding range. The cursor shows a pistonmelting 15:1 air/fuel ratio at full throttle at 72.6 mph. No need for a cruise test — which was explained last month — here. Would a four-pot tuner fix this problem? Remember that these devices move the whole line down (richer), above, or below the transition rpm. No way! It simply can’t do what Dave needs. How about isolating the mountain with a Race Fueler by setting transitions at 63 and 87 mph (2800 and 3800 rpm) and pushing it down with the “mid” pot? Well, you’d certainly end up with a wavy air/fuel curve, but you can’t do it anyway because the mid-to-high transition point is 4500 rpm minimum. What we really need here as a line flattener is something with a better rpm resolution. I installed a Power Commander and loaded an exact component-matching map from Power Commander’s map database, the one shown as the Sample Power Commander Fuel Table. In the 100 percent column, note that it adds 10, 16, 12, 8, and 7 percent more fuel from 2750 to 3750 rpm, right where we need it. The result was the black lines, which was much better — not perfect, but at least it pulled the pistons out of the fire and back into the frying pan. At this point, Dave was encouraged by the progress and paid me to customize the map on the dyno by adding even more fuel, resulting in the red air/fuel line. I then went on to tune the 80, 60, 40, and 20 percent throttle opening columns. For those of you hooked on peak numbers, be assured that the red lines weren’t the final run, which was well above any of the lines shown. To me, John’s racing 2002 Heritage is the most interesting. With the promise of big horsepower and torque, he had his dealer install a 95" kit with big-name aftermarket heads, cams, and a TFI. By the time he brought the bike to me, I think he had probably already resigned himself to the fact that you rarely get what you pay for, but this package had turned out to be a major letdown. Sensing he was hoping for some magic, I let him know before I even ran it that it would probably be rich in the midrange due to the cams and the pipes, and that the TFI would probably have to be replaced with a Power Commander. He didn’t want to spend any more big bucks on the bike, but it certainly wasn’t any fun riding it the way it was, either. The third run (the blue lines) showed an almost unridable, no-fun bike. It had a super-lean stumble off idle, rich with just okay torque in the midrange and decent peak horsepower, but the engine ran out of fuel at the high end. I tried tuning the TFI, but with only enrichening ability and one rpm transition point, it was all trade-offs. I brought up replacing the TFI with a Power Commander again. He asked, “Isn’t there anything else [meaning less expensive] you can do?” Noting the plateau in the torque curve, I suggested adding some backpressure to the pipes and seeing if I could flatten out the air/fuel curve enough to give the TFI a chance. An hour later, after installing my TorqueTuners and tweaking them and the TFI, I had the black curves. The air/fuel graph was still nowhere near perfect, but it was well within acceptable bounds. The color was starting to return to John’s face. After he took his “new” bike off the dyno and headed down the street, it was obvious that his adrenaline had kicked in, too! All this talk about tuning devices and programmers sounds time consuming and expensive, so why not just install a system that will tune itself while you ride and be done with it? All you have to do is install the bungs and oxygen sensors in your pipes, just like on the 2006 Dynas with their O2 sensors, right? Unfortunately, it’s not quite that easy, and it doesn’t work that way. 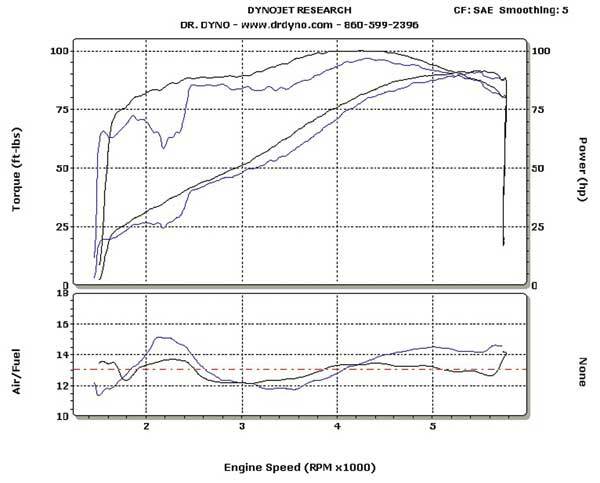 John’s racing 2002 Heritage came in with a super-lean stumble off idle (blue lines), that went rich to produce just okay torque in the midrange and decent peak horsepower. However, it ran out of fuel at the high end. Let’s take Harley’s system, which is strictly for emissions, first. You know, the 14.7:1 air/fuel ratio thing. This is the same type of closed-loop system that’s been working pretty seamlessly on cars for 20 years. On stock and near-stock Dynas, it works quite well, but I’m hearing some real problems once cams or other performance modifications are installed. Here’s an example of a closed-loop system: When you’re riding or driving down the road and controlling your speed with the throttle, you’re in open-loop mode. However, when you set your bike/car’s cruise control for 65 mph, this puts the vehicle into closed-loop, and the cruise control system will continually adjust the throttle to maintain 65 mph, or very close to it. Now, substitute a cruise control system that’s trying to maintain 65 mph for an emissions control system that’s trying to keep to a 14.7:1 air/fuel ratio, and you understand how H-D’s Dyna system works. Now suppose you braked and slowed down to 30 mph. Would you then resume your 65-mph cruise from 30 mph? No, on a bike you’d be shifting down and up, and manually getting close to 65 before hitting resume, wouldn’t you? You could resume from 30 in a car with an automatic transmission, but the transition might not be so smooth, depending on how quickly it decided to get back up to 65. Well, it’s the same with the 14.7:1 emissions system. It relies on the maps in the ECU’s memory to keep it close to 14.7:1 before going into closed-loop mode. The oxygen sensor used is called a narrowband sensor and it’s essentially an electronic switch that flips on and off at 14.7:1. If we change engine components without changing the maps to match the new setup at least somewhat closely, the air/fuel ratio is in for a wild ride, giving the rider anything but a smooth one. If tune-themselves-as-you-ride systems are going to tune for power, not just emissions and fuel economy, they need to use an entirely different oxygen sensor: a wideband one, which gives a linear output signal as the air/fuel ratio varies from 10:1 to 18:1. This is the same type of sensor used on a dyno to give the air/fuel curves seen in the graphs. One product states that it uses a wideband sensor in each pipe, which makes sense to me because each cylinder runs differently, sometimes quite a bit differently, with cams and unequal length pipes. That system also states that it can tune itself, but that using it requires proficiency in Windows, fuel injection mapping, Delphi EFI, and air/fuel ratio tuning. The other system I’m aware of uses one sensor and doesn’t state if it’s wideband or not. The company says the product will tune itself in 50 miles, but that you should then do a plug check to see how it’s doing. After 300 miles, you should note improved fuel economy. 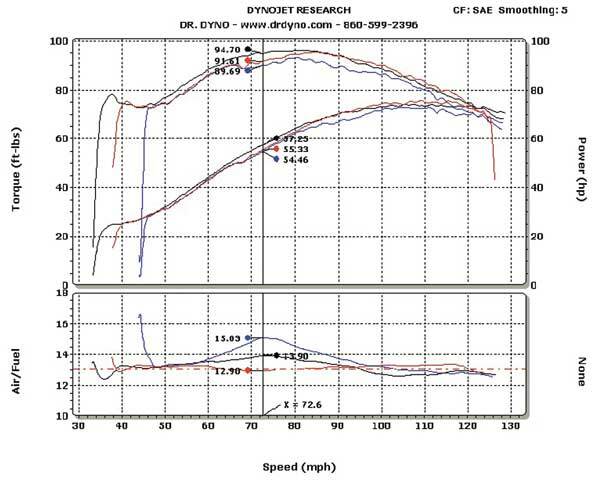 The instructions tell you how to test it on a dyno, and I note that the company’s own graph shows 27 dyno runs (runs 002- 029) were used to get good results. That raises some questions for me, since all an inertia dyno does is simulate acceleration. In my opinion, if I can’t ride one of these bikes onto the dyno and rip off a perfect full-throttle run with a warmed-up bike, I can’t do it on the road, either. One thing this article should put to rest is the notion that, without an airflow meter, Harley’s EFI systems can somehow adapt themselves to component changes. All the ECU has to go on is a set of memorized values. Even an emissions oxygen sensor doesn’t help at full throttle as the ECU goes into open-loop mode, ignoring the sensor entirely. Many Twin Cams — about half, in my experience — are already rich enough from the factory that they don’t need any fuel changes for a pipe and air cleaner upgrade. You need power and cruise dyno tests to know for sure. The problem is, it’s hard to find a dyno operator who will level with you and tell you that you don’t need the tuning device he’s selling. And performance parts sellers usually want to sell packages with the assurance that they will all play well together. Education and savvy are your best defenses. In general, if you see every bike getting the same thing (a high-flow air cleaner being the exception), you’re probably watching wallet tuning in progress. Just this past weekend, I instantly solved all of a stock-cammed Ultra Classic’s tuning problems by loading a zero map in its Power Commander, meaning it was perfect without any tuning device. A couple of bikes earlier, we took a pot-style addon device off and put a Power Commander on because the engine’s performance parts made the air/fuel curves too wild for the controller to correct. As a rule of thumb, if you have the stock cams still installed in the engine, any of the pot-style devices mentioned last month will do the tuning job quite well — if it needs doing, that is. Once you change cams, even to mild SE-203s like we saw with Dave’s Ultra, you’ll very likely be beyond a pot-style device’s design limits, needing instead the higher-rpm resolution bands, both richer and leaner air/fuel capabilities, and, possibly, the ignition tuning capabilities offered by the mapstyle devices. Yes, John, with his cammed and TFI-equipped bike, did end up very pleased, as his burnouts showed, but it took an hour, some creative solutions, and just plain luck to pull the bike’s requirements to within the TFI’s capabilities. I even surprised myself with how well I got that one running! With a change of cams, you have two choices. First, start with Harley’s download, but don’t expect it to be perfect calibration or a match, especially when using non-Harley pipes. If the download isn’t close enough, you’ll need one of the mapstyle options that we discussed. The Screamin’ Eagle Race Tuner programming unit has an advantage in that the download is included in the purchase price, but also the disadvantage of tough tuning if more dialing in is needed. It’s my experience that few dyno tuners will touch a SE Race Tuner, outside of guys at dealerships. Even then, many outside guys will get the engine running okay, but won’t show you the final air/fuel curves. As for the Power Commander, especially now that it has the 6200 rev limiter option so you don’t need the H-D download, it has the air/fuel range and rpm resolution to handle even the wildest of builds, and it can be removed without a trace, if desired. Dynojet, in my opinion, has the best free map database going, which may be all you need. If more dialing in is needed or desired, a dyno tuner trained at Dynojet’s Las Vegas tuning center should get it done in about half an hour. A full custom map (starting from a zero map) shouldn’t take much more than an hour. I’ve even used a Power Commander to tune around a download someone had modified with a SERT. Since the programmers obviously make internal changes in the ECU, warranty issues may come into play. And, unlike a Power Commander, a programmer permanently locks itself to the first ECU it is used on, so it can’t be transferred to another bike.The SERT is somewhat of an expensive ($460) enigma. Many dealers are using it simply to do a $150 download. The reasoning is that all the Stage downloads are on the CD, so if you upgrade to another stage or two later, you almost break even. Plus, you now have the tuning option available. Of course, Harley’s downloads are only meant to match its own Screamin’ Eagle components, and then only in certain combinations, but that’s what most H-D dealerships are going to install anyway. Maps for other combinations are available for purchase in the aftermarket. That adds to the price, but if you get a good match, all is well. A bad match is where the “easy button” quits working. Oftentimes, when a well-meaning tech tries to adjust the maps, it gets worse. But even if he fixes some of the problems, he doesn’t usually give the bike’s owner the modified maps on a disc. By the time the owner brings it to me, it may even have been on another dyno. And, unless the owner brings me both his black interface module (the key) and the last modified download on disc (if the dealer will give it to him), I have to start from scratch and I’m back to Harley’s Stage downloads, the only free maps available. Dialing in can take one to three hours, or, as stated in a letter to AIM that was printed a few months ago, it can take all day. On a better note, for those who don’t want a device attached to their bikes, try Direct Link. Direct Link is catching on with SERT tuners because it’s much more user friendly. However, it’s not as well known yet and has the same “last download file” and slow download limitations as the SERT, but at least the menu structure is almost as easy to use as a Power Commander. In my opinion, EFI tuning is like riding through a city. With a SERT or Direct Link you have to stop at every red light for 40 seconds, with the SERT’s VE tables acting like construction detours. With a Power Commander, since you never have to stop, all the lights are green. If you don’t have access to a dyno tuner you trust, I highly recommend that you choose your cams, displacement, heads, and pipes based on the available exactmatch H-D downloads or Power Commander maps. The maps will be close, if not perfect. If you go with another combination figuring it’ll be okay, I’d suggest including a budget for tuning and blood pressure meds. LET ME IMPOSE MY TAKE ON ATOMIZATION, AT NO EXTRA CHARGE. With fuel prices rising, many aftermarket devices are touting how they mix fuel with air more thoroughly, and, therefore, provide better fuel atomization. These devices get installed in either the fuel stream or air path and somehow swirl the air or molecularize the fuel better, resulting in all the supposed benefits of better atomization. Think about that. You might fall for it with a carburetor because, as the air flows through it, the fuel is mixed in with air pretty much continually. Conceivably, there might be ways to achieve better atomization. But enter port fuel injection, as used on Harleys and most automotive applications, and the whole picture changes. The injectors quite literally squirt the fuel into the intake manifold just ahead of the intake valves, and they do it when the valves are closed. In fact, early (1970s) diagrams of Bosch fuel injection depict a drop of fuel sitting on the back edge of an intake valve, waiting for it to open. Please explain to me how or when the fuel gets atomized in a fraction of an inch in a few microseconds. Being a great deal further upstream, a carburetor (or throttle body injection) should be able to atomize fuel so much better in that more power, better economy, or both should be the result, but, in my opinion, neither is the case. It seems to me that all atomization must occur inside the cylinder (which is why a squish band in the combustion chamber does so much for power and efficient burn of the air/fuel mixture) and, therefore, has absolutely nothing to do with anything in the intake tract.